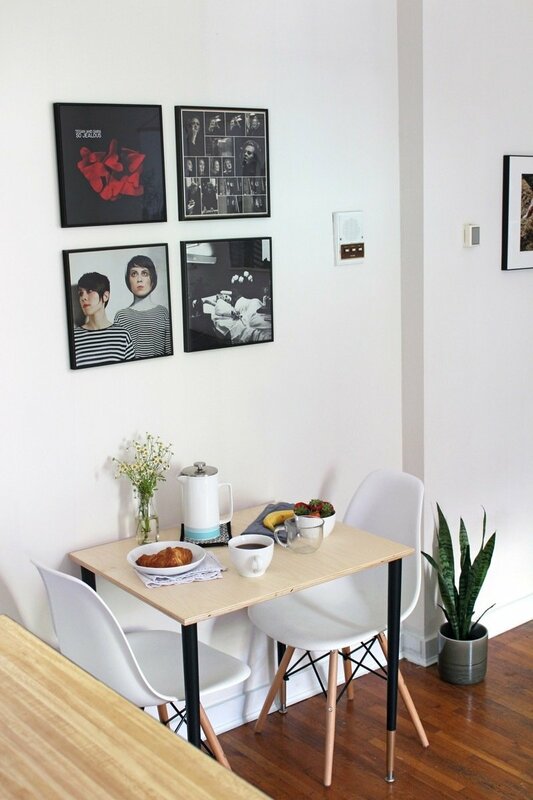 This small dining table literally took a day to make, and it inhabits less than three feet of wall space. Since it's just myself and my fiancée living in the apartment, a two-person table was all we needed. Admittedly, we usually eat on the couch, but it is nice to have a space to sit and share a proper meal together when we want to. My favorite part about this small dining table may be that the legs can come off when we need to move - so compact! To give the table a cleaner and more finished appearance, the first thing I wanted to do was round the edges. Since I chose 13-ply Baltic birch plywood as my tabletop, I knew the exposed edges would look pretty cool. Plywood with more layers is more expensive, but it's definitely worth it for a project like this. With Bruno's help, we rounded both the top and the bottom edges of the plywood. 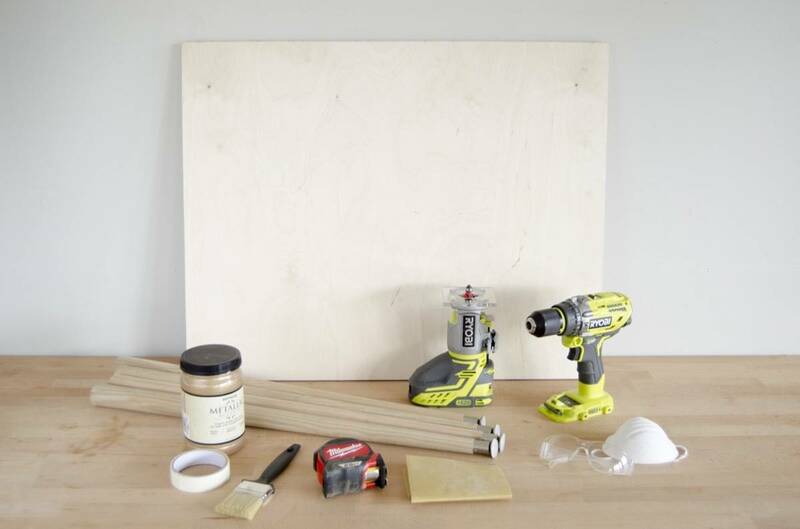 To do this, we used our Ryobi ONE + Trim Router Tool. The tabletop was firmly clamped in place to keep it steady as we worked. After attaching a "rounding over" bit, we routed the top edge of the tabletop, flipped it over, and did the same for the other side. Next, I sanded the entire plywood board with an orbital sander. The wood was fairly smooth to begin with, so I went straight for the 220 grit sandpaper. I also lightly sanded the rounded edges by hand. To protect the table from future spills and messes, I coated the wood in polyurethane. I applied one layer of the sealant, and waited for it to dry. Then, I sanded the tabletop again with a 220 grit sandpaper, and applied a final layer of polyurethane. The legs for this small dining table were a breeze to finish. I taped off lines at the bottom to create this two-toned look of black and gold paint. The gold and black legs are a definite nod to the Mid-Century Modern aesthetic, and that look is something you'd find on lots of tables from that period (1940s-1960s). Once the tabletop had completely dried, I attached the leg mounts to the four corners of the table using our Ryobi ONE + 18-Volt Hammer Drill. After that it was just a matter of screwing the legs in place, and the table was ready to set! One of the design rules that I try to stick to in my apartment is to keep it open and airy. A cluttered apartment makes both myself and my fiancée stress out a bit, so even though it takes longer to find pieces that jive with the space, it's always worth the wait. Want to see what else we've been working on? Check out this stump side table we just finished!